I use TS client to connect with smartcard from my home Vista machine to various machines at work through a Terminal Services Gateway. When I'm connecting to Windows 2003 or Longhorn machines I am only required to input my smartcard pin and this is enough to authenticate me. However, when connecting to my alinc02 Vista machine, things are not that smooth. On this machine, TS asks my smartcard pin, after that it fails with the following message: "Your credentials did not work. 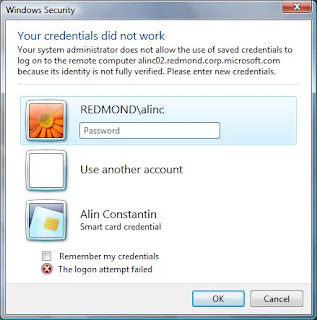 Your system administrator does not allow the use of saved credentials to log on to the remote computer because its identity is not fully verified. Please enter new credentials." Of course, after typing my domain user and password the connection succeeded, but why was this dialog necessary? It turned out that my issue was described in this article from Terminal Services Team Blog, under Scenario 1 (Problems using saved credentials with Vista RDP clients - Connecting from home to a TS server through a TS Gateway server). There was also a solution proposed, too. However, since I was connecting to a Vista machine, I could not use the recommended solution (tsconfig.msc is only available on servers and I could not get to work on my Vista machine the applet copied from a Longhorn machine). Fortunately there is a solution by altering the TS settings on the client side (this solution is not as secure as using certificates on server for server authentication). In Vista, the Credential Security Support Provider protocol (CredSSP) adds a couple of group policy settings that are described in detail in MSDN CredSSP group policy settings page. 1. Log on to your local machine as an administrator. 2. 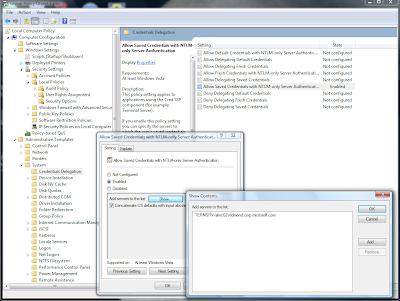 Start Group Policy Editor - "gpedit.msc" and accept the UAC prompt. 3. Navigate to "Computer Configuration\Administrative Templates\System\Credentials Delegation". 4. Double-click the "Allow Saved Credentials with NTLM-only Server Authentication" policy. 5. Enable the policy and then click on the "Show" button to get to the server list. 6. Add "TERMSRV/" to the server list, in my case TERMSRV/alinc02.redmond.corp.microsoft.com. Using one wildcard (*) in a name is allowed. For example to enable the setting on all servers in "microsoft.com" domain you can type "TERMSRV/*.microsoft.com". 7. Confirm the changes by clicking on the "OK" button until you return back to the main Group Policy Object Editor dialog. With this policy enabled, the login to my alinc02 machine now requires only the smartcard pin, same as the other machines. Since we're speaking of group policies, it worth mentioning another setting here, "Allow Delegating Default Credentials", which helps making TS connections to a remote server (in the same domain) without being prompted at all for credentials (current Windows user's credentials are used for the remote server). For more information on this see Mahadev Alladi's blog article which inspired the settings in my case, too. DUDE. This just totally saved my bacon today. Googling on the text of the error message led me to a forum where you posted a link to this blog entry, saying that no one understood the issue. *You* understood, and this solution totally worked for me. But then suddenly my logins stopped pestering me. I just wanted to say thank you Alin for your most helpful blog-entry on resolving the "can not store credentials" issue on Vista. It helped me resolve this issue. It WORKED! Thanks for the info. I've been working on this problem all morning/afternoon. Your solution did the job! Many thanks once again! Excellent tip - thank you! Thanks for actually knowing what you're talking about. This has saved me who even knows how much time! Thanks for the assist. I really appciate the info. I had the same problem with my Server 2008 R2 and Windows 7 workstations network. Thanks Alin. It was driving me insane! Yes, this is a real gem. I maintain many VMs up in a vCenter blade on a private virtual network switch that are accessible only through a firewall/proxy that runs on Linux. My desktop is now Windows 7 (love it) and this credential issue over Remote Desktop has been a frustration. I'm able to use the workaround you outline (with TERMSRV/* setting) to get to a Win 2008 R2 server now for the first time. Assume other types of desktop-VM combinations will work also. Thanks so much for writing this down! Thank you so so much! This has been an issue for about 2 weeks now, and being a productive freak, I always got frustrated by not having RDC "just work". You deserve a cold one today! Different behaviour when RDPing to W2k3 and W2k8 was a little tough to figure out, but this made sense and worked well for me. Love it when someone eloquently solves a problem you're having. Please note, people, this DOES sometimes take a little to kick in. Give it a few hours and try it. Thanks so much, I've been wanting to solve this for months! Awesome... after typing my password, or, worse, having to dig back and forth finding the correct service account password - finally, the fix. Thanks! Thanks. It worked also for connection from 7 Ultimate to Server 2008 R2 Enterprise. Has anyone managed to get this to work using IP addresses rather than hostnames? I've got to the point where I can save my credentials to hostnames, but not to IP addresses, which seems like extremely weird behaviour indeed. Is there something I've missed? Thanks very much! I found other tutorials about the gpedit navigation, but this one explained adding the server names to the list of approved servers. 2. I need to access few of my desktop & server from my machine. 3. OS of desktop & server are Windows 7, Server 2008 & Server 2003. 4. I can save all the credential for 2003 server but not for 2008 server & windows 7. 5. I tried your solution for both machine on my system from where I need access & on client/server which access I need. but it does not work. Any other solution please, it is irritating to put user name & password each time.